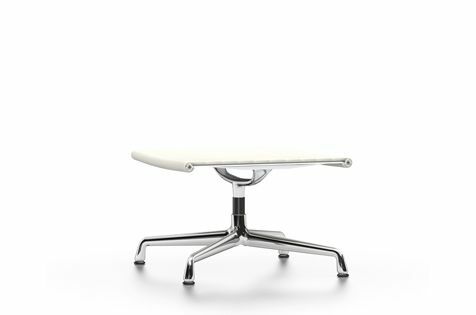 Designed as a stool or ottoman for the chair EA 124, the Aluminium Chair EA 125 has a non-swivel, four-star base in chrome-plated or polished aluminium. When paired with the swivel lounge chair EA 124, it forms a comfortable recliner for long cosy evenings with a good book. Non-swivel. Upholstered with high-frequency welded ribbing in Hopsak, Leather or Premium Leather. Side profiles and spreaders in polished or chrome-plated die-cast aluminium.